Retain your independence and stay in the home you love. 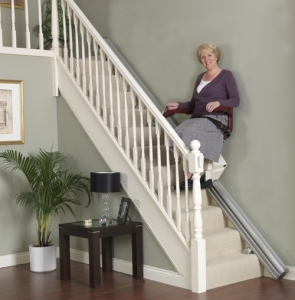 Family 1st sells and installs stairlifts across Nova Scotia. Family 1st Medical is an authorized installer of stairlifts. Our experienced, friendly staff will take care of everything from measuring and installing the stairlift to performing any needed repairs or inspections. Models shown may not be what is currently available for install – please call for details 1-800-565-2021.